Peter Pap Oriental Rugs presents the following exhibition of pile and flatwoven bags from the tribes and villages of the Near East and Central Asia. These antique ethnographic pieces are presented in no particular order and represent a geographic region from the Caspian Sea to the Oxus River in Central Asia. Some were woven as bags for animals others as tent bags. Regardless, they represent broad weaving traditions from several related traditional cultures which each placed tremendous value on these hand-crafted utilitarian objects. This is a sales exhibition. If you are interested in any of the pieces listed here please contact Peter Pap Oriental Rugs at our San Francisco Gallery. The inventory numbers of each piece are hyperlinked to our site, www.peterpap.com. We also have a larger selection of bags and trappings in our Saddle Bags & Trappings section of our website. Thanks for your interest. Peter Pap Oriental Rugs of San Francisco, Inc. 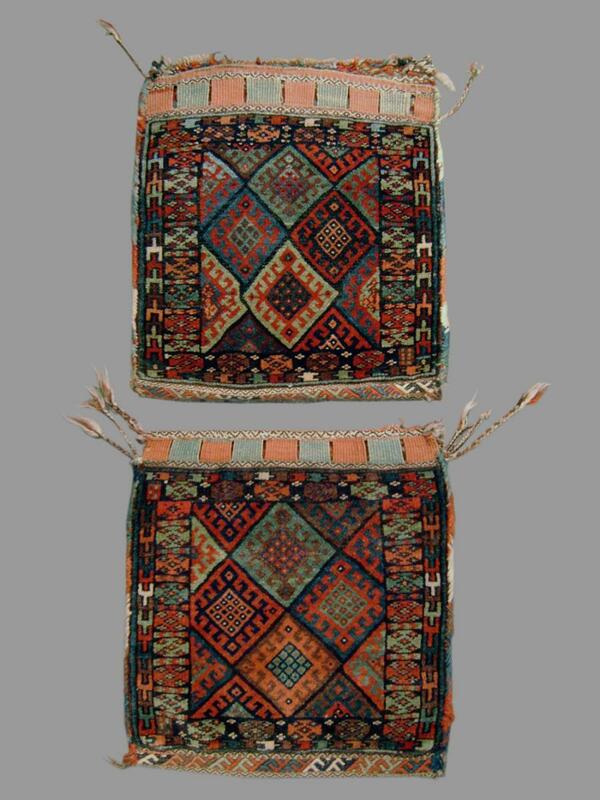 This unusually finely woven complete set of saddlebags is in an excellent state of preservation. The multi-colored octagons in the field are drawn boldly on an ivory background. This piece demonstrates the added value complete bags provide in understanding the nature of weaving. One might notice that the octagons organically shrink by following the direction in which they were woven from the top of the lower bag to the bottom of the upper bag which ends with a row of half octagons. There are numerous small repairs throughout. This complete set of Northwest Persian khorjin features elegant floral ivory diamond centers. 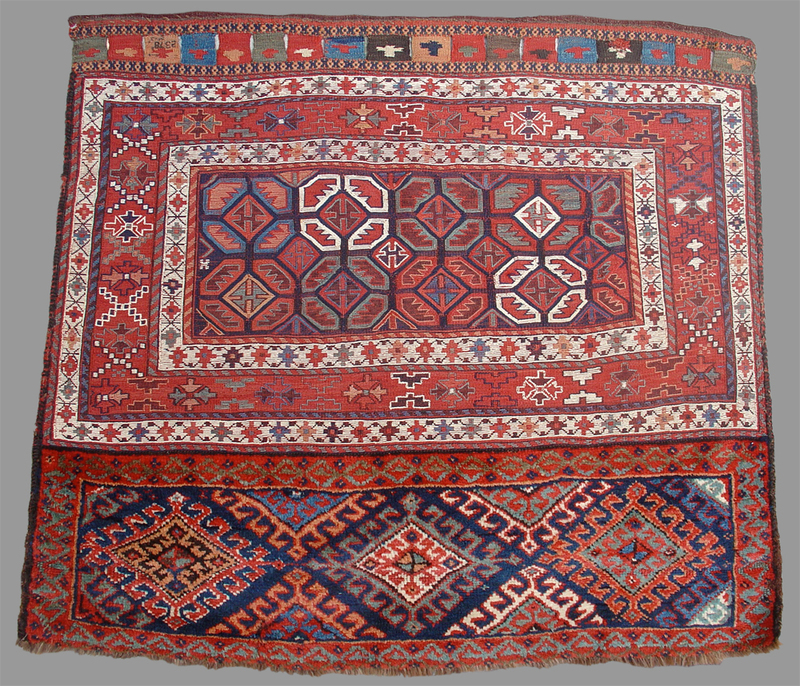 Botehs of various sizes are drawn in the field demonstrating strong Persian influence. The wool pile is thick yet soft. Some areas with moth damage. Baluch weavings are known and loved for their polychromatic blues. Indeed, the colors of this piece are very nicely balanced using a minimum of white. This bag was woven in Khorossan close to the Afghan border and uses the iconic 'shrubs in lattice' design. The wool is soft and the pile face is supplemented by the full back complete with fastening system at top and floating weft work on the top and bottom. 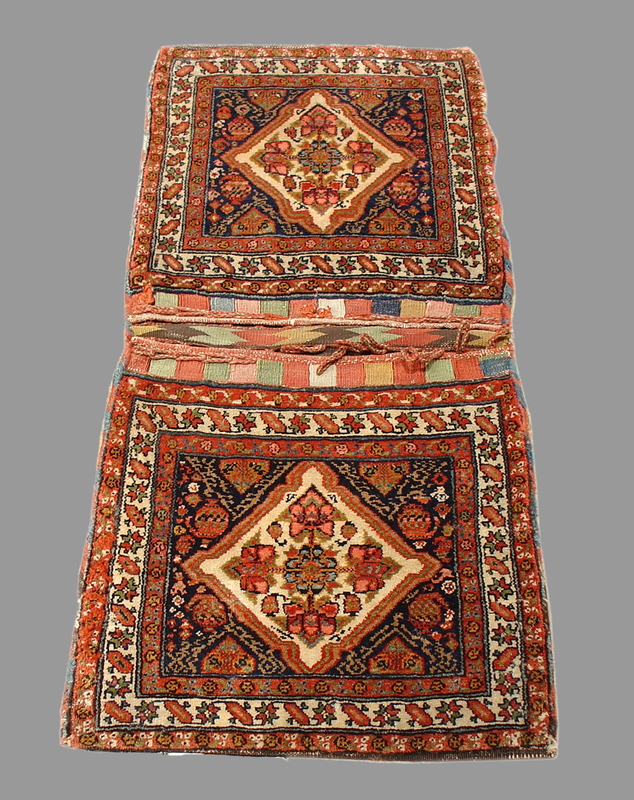 The Kizyl Ayak or 'Red Foot' Turkmen of the middle Amu Darya area maintain a design repertoire often confused with that of tribes from further west. 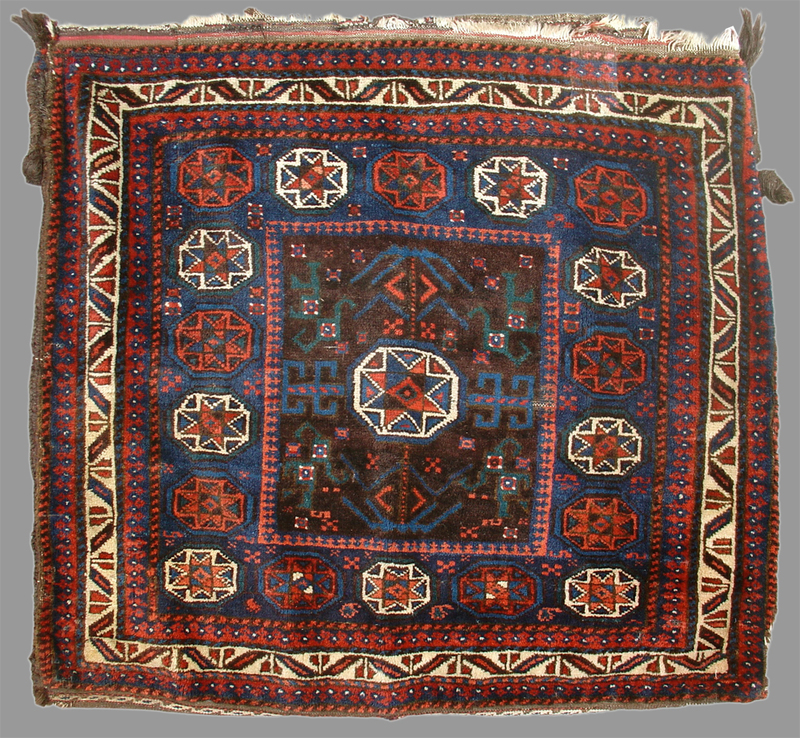 This tent bag face, in excellent condition, uses the characteristic saturated brick red ground with chuval guls and chemcheh minors that the group is known for. It is accented nicely with green and yellow. 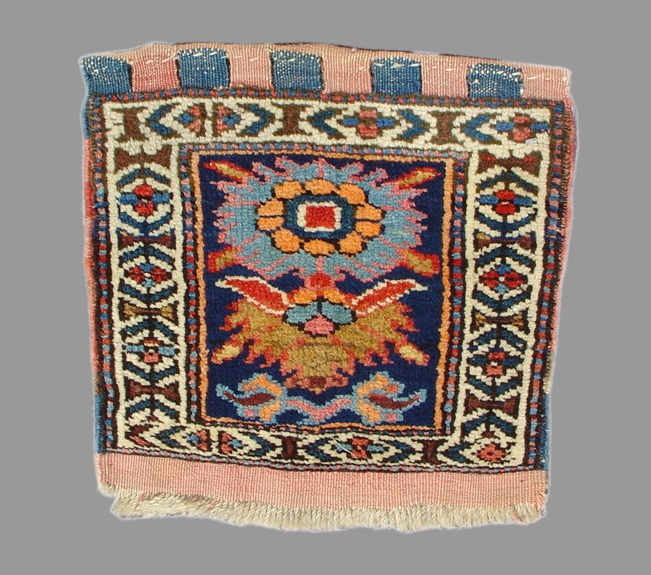 A portion of the fine kilim back is preserved at the bottom. 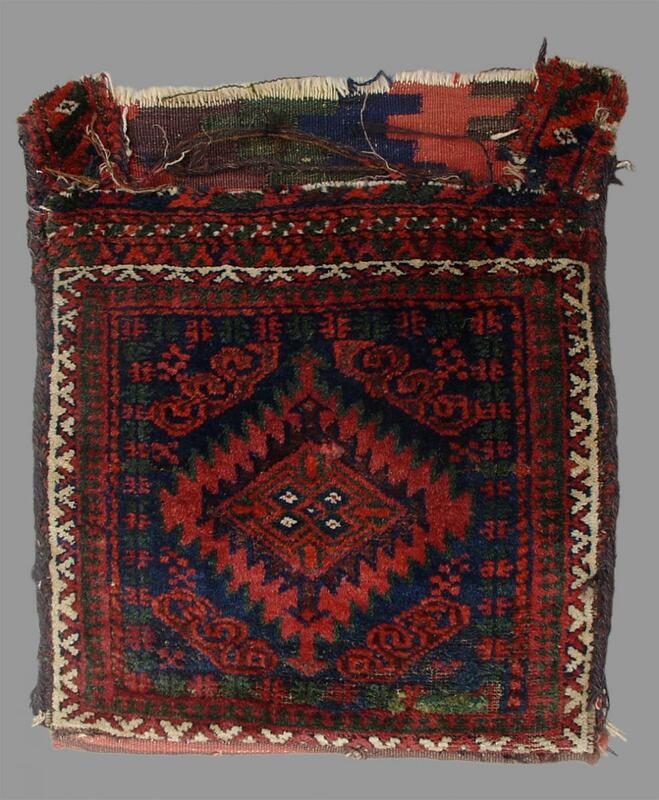 This small bagface represents much of what is loved about Qashqai weaving, varied and saturated color, soft wool and a variety of geometric, animal and floral elements throughout. The central flower is a boldly rendered from older Persian prototypes while the pair of opposing stags add a definite tribal flair. Indeed, this piece is nicely balanced throughout. note the perfect corner resolution of the main borer. There is analine dye which has bleed on the back. Kurdish weaving is often enigmatic. While Kurdish weavers were certainly influenced by the larger weaving traditions, be it Persian or Anatolian, of the regions where they were living, they contributed as well to these traditions. The simple yet all-encompassing floral burst fills almost the entirety of the small field of this bagface. 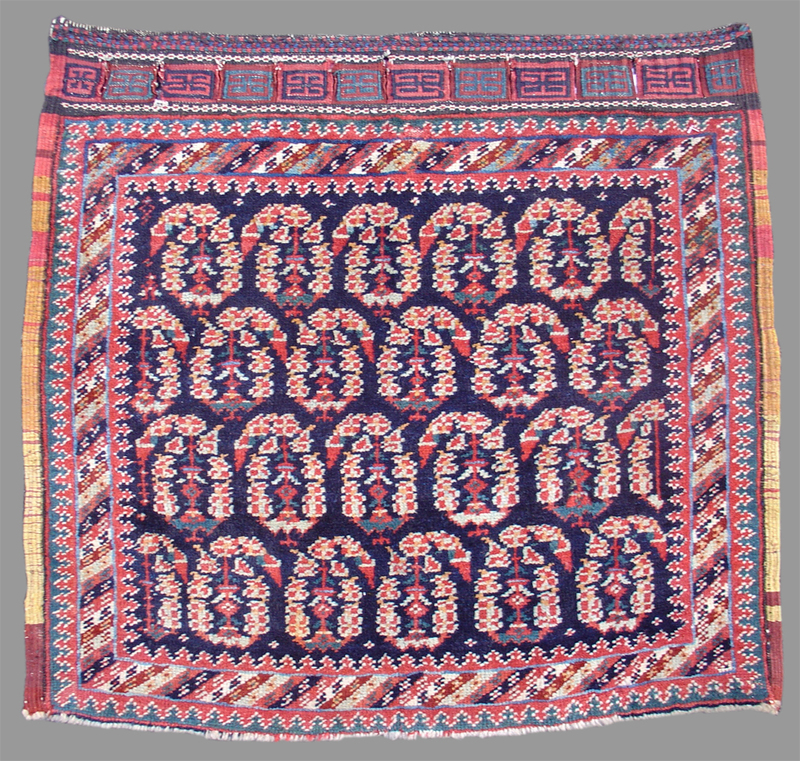 (Those familiar with Baluch weaving may notice some glaring similarities between this colorful multi-directional floral border with the so-called "fish bone" border found in some pieces from Khorossan). Red and orange are analine. This is a classic Shahsevan soumac using three of the most prevalent types of borders found in the genre. The central border is particularly aptly placed as it imparts a unique sense of movement to the piece and contrasts nicely with the boldly drawn more static elements of the neighboring borders and the field. Excellent condition, slightly faded from original color palette. 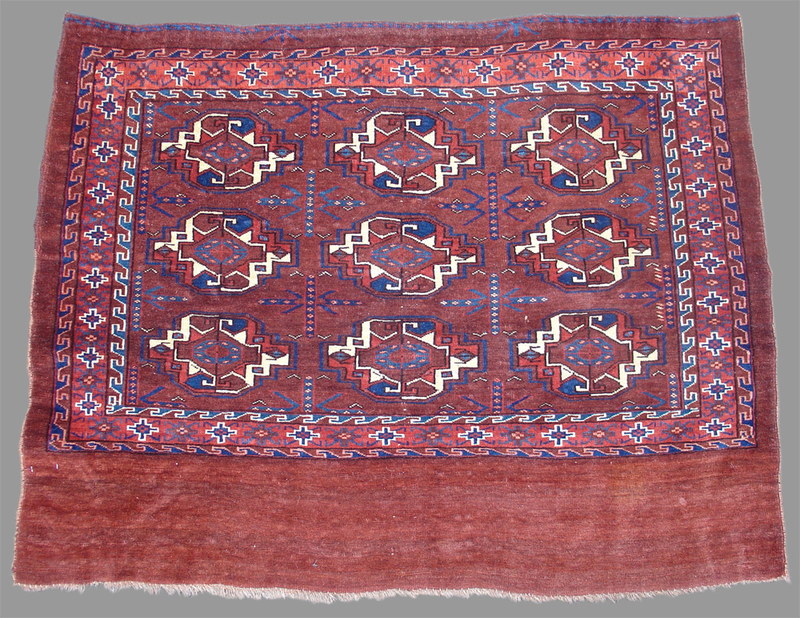 Though battered and worn, this is a good example of an ikat designed chuval from Central Asia. 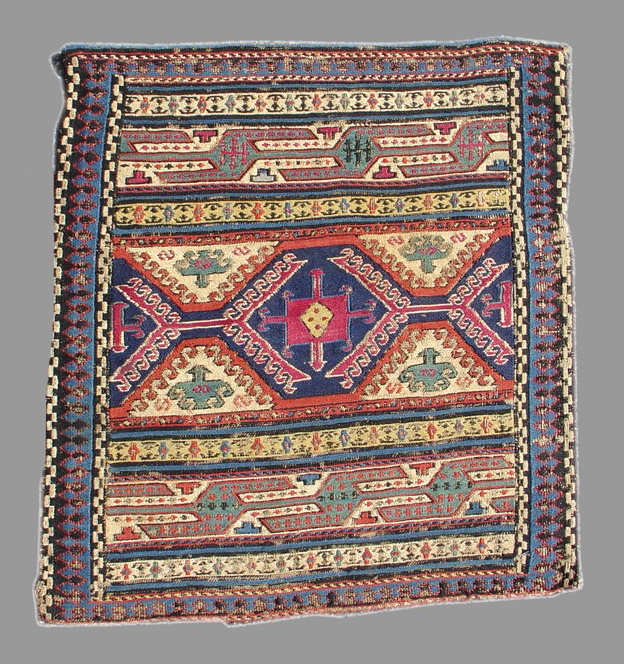 It may have been woven by the Ersari Turkmen of Central Asia in the region of the Oxus or Amu Darya River. Because of the lip-shaped form of the main elements, it belongs to a design group recently dubbed "the Marilyn Monroe" type. Ikat inspired designs reflect the importance of textile designs as models for pile weaving. 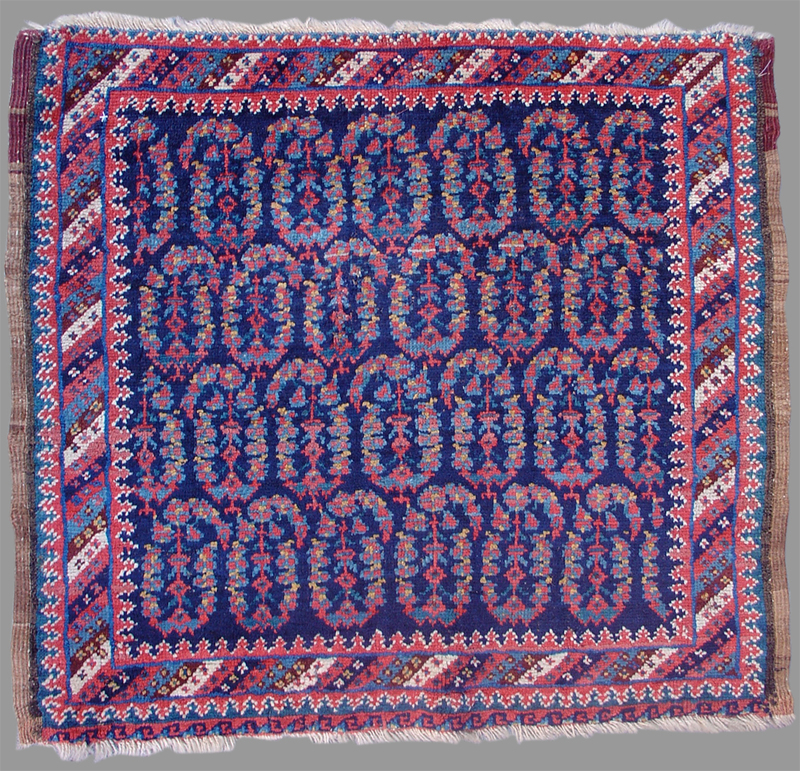 Bags with this type of square middle and others with stars in octagons are some of the most iconic weavings of the Baluch. 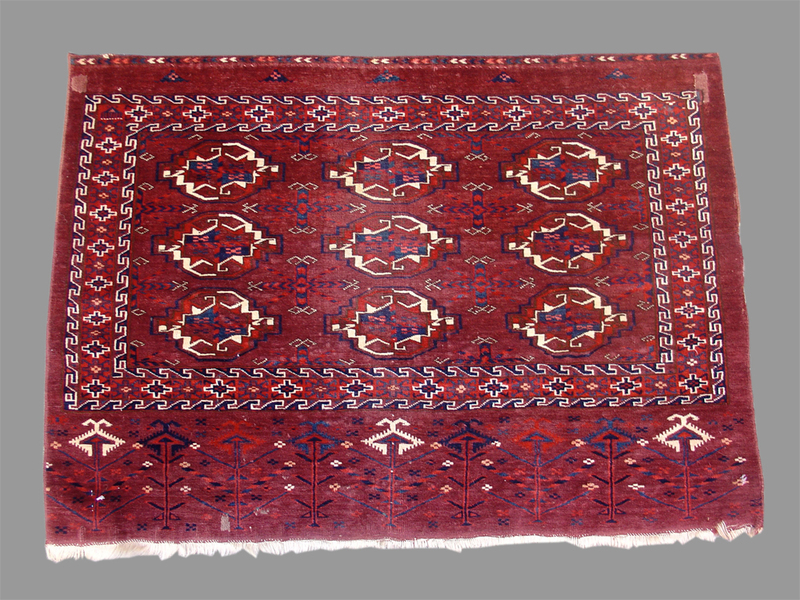 This piece has full glossy pile, saturated colors and the complete original kilim back attached. Unlike many other examples of this type, the center and browns of this piece are well preserved and not corroded. This may be because of the slight aubergine tint of this color. Further, the range of blues and greens is particularly good. One re-weave in upper border. 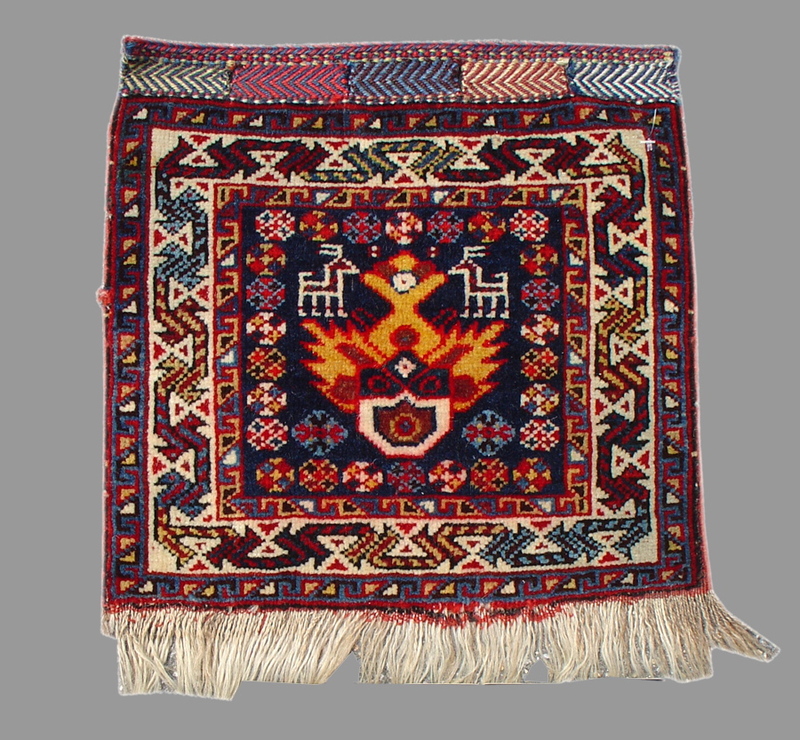 This is an iconic example of sumak weaving from southern Azerbaijan. 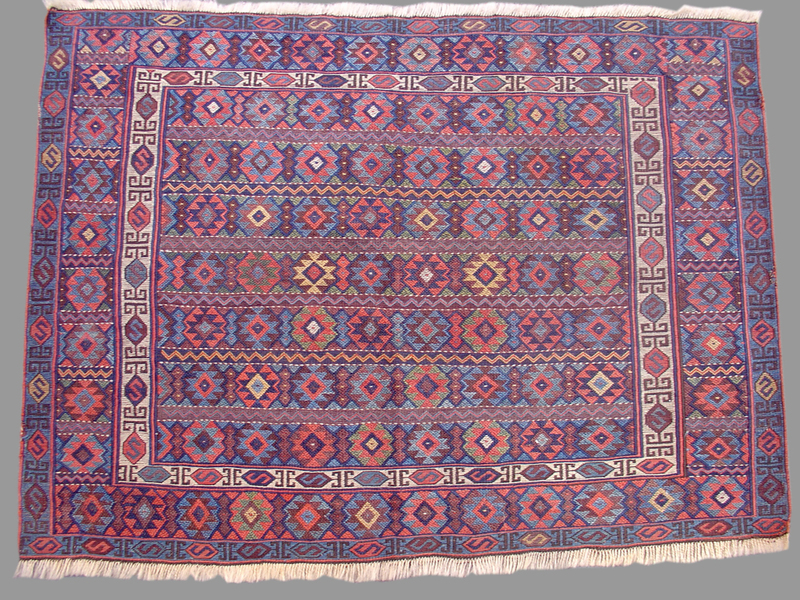 Originally one of the two short end panels of a rectangular six-sided mafrash, it was woven with exceptional colors and has the soft patina of a much older flatweave. The birds and geometricized trees of the above field are bold and rustic and drawn with an array of saturated mostly secondary colors including aubergine, green and orange. Good condition with corrosion of blacks and side rebound. 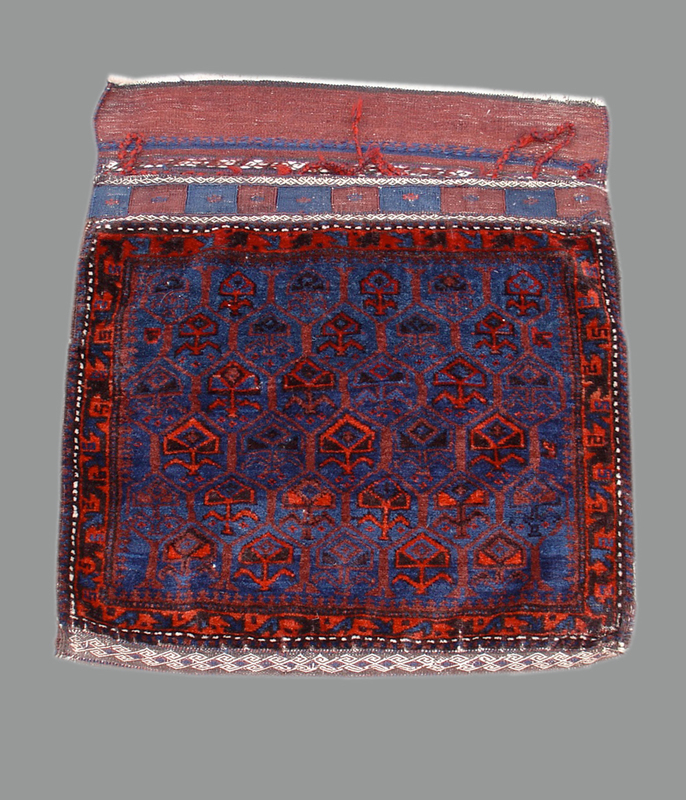 This bag was probably woven in southeastern Persia in or near the region of Sistan. Evidence of this are both the central serrated diamond with an ashik center and the pile portions of the central bridge at the top. Sistan pieces are known for their adept use of greens and this piece certainly does not disappoint in color. The red in fact is much more vibrant than appears in this image. The soft wool used is in keping with the best of Baluch weavings. 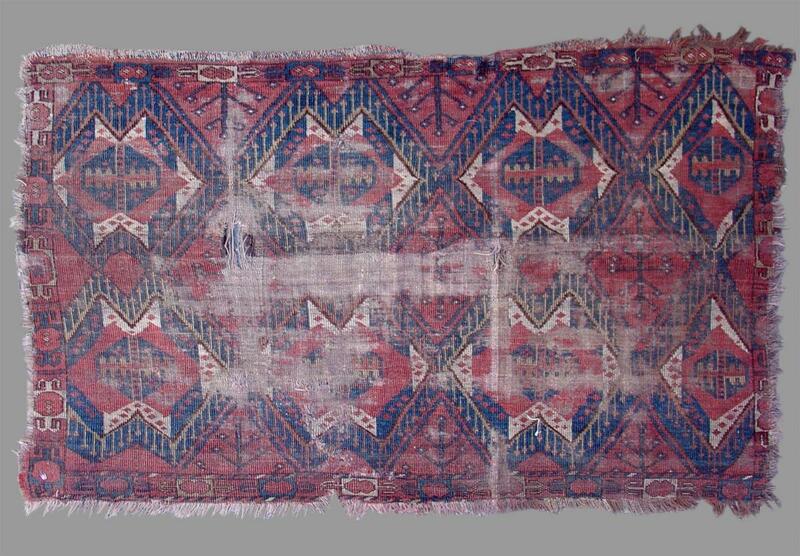 This larger rectangular bagface from central Persia shows the connection of Veramin pieces with the weavings of Kurdish and Shahsevan groups from further west. The multi-colored tessellated soumac octagon tile design of the central main panel is particularly well executed with quatrafoil centers and serrated leaf-like motifs. The longer pile bottom panel with latch-hook devices may or may not be considered an elem but acts as a good bottom weight to the composition. Whites are cotton. An exceptional multicolored palette defines this complete saddlebag with soumac faces. There are at least three blues, two greens and three shades of red/pink present in this piece. 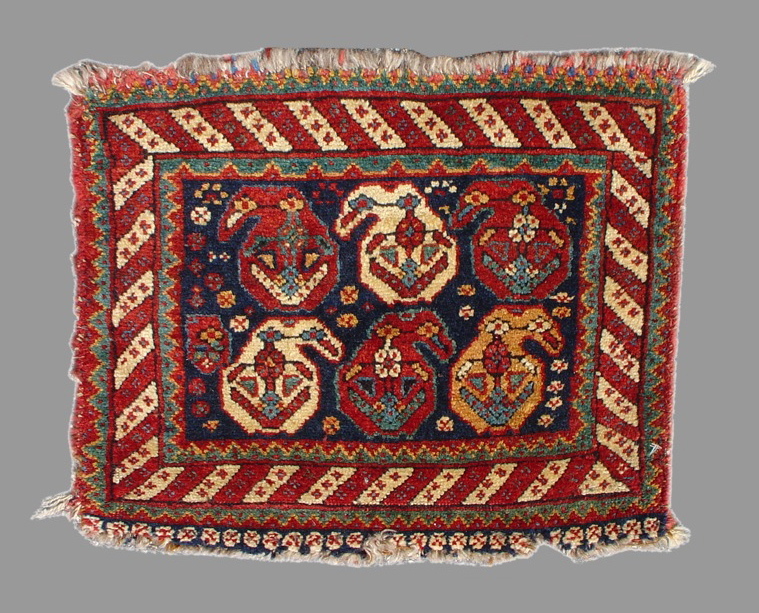 The diamond latch-hook motifs of the field are elegantly drawn and a favored motif of the Turkic tribal peoples of the Caucasian borderlands. This piece would benefit from a cleaning. The orange in the kilim may be analine. 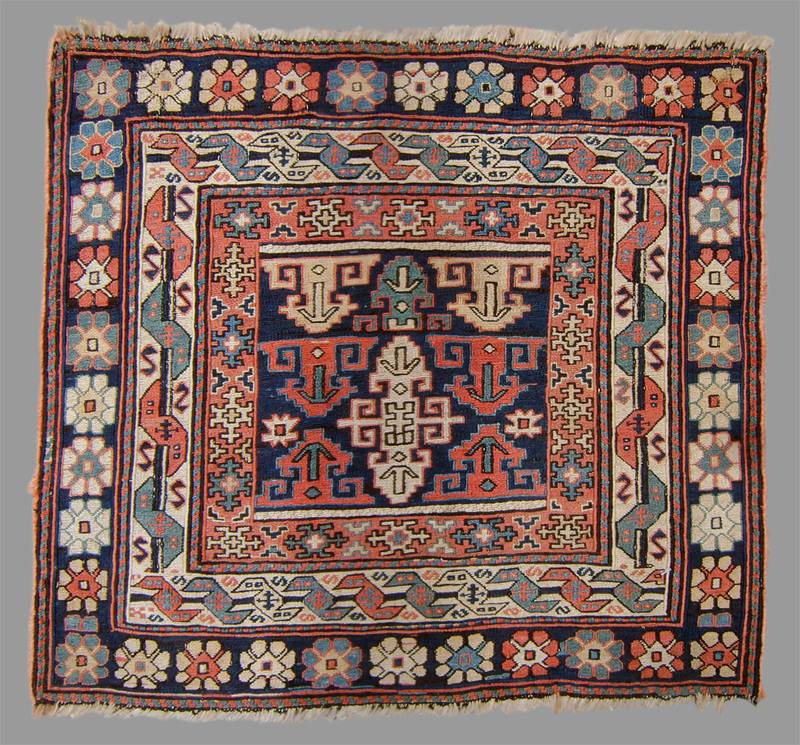 The spacing of this finely woven Turkmen chuval with a blank elem is quite fine as are the narrow and elegantly drawn chemcheh minor guls. The main chuval guls are just as they should be with pearl roundel centers of the type more frequently seen in Tekke and Eagle Group bags and trappings. it is in very good condition. While the diamond design of these Jaf Kurd bags is more or less standard for the type, the large-scale format is not, especially when the smaller size of these bags is taken into consideration. 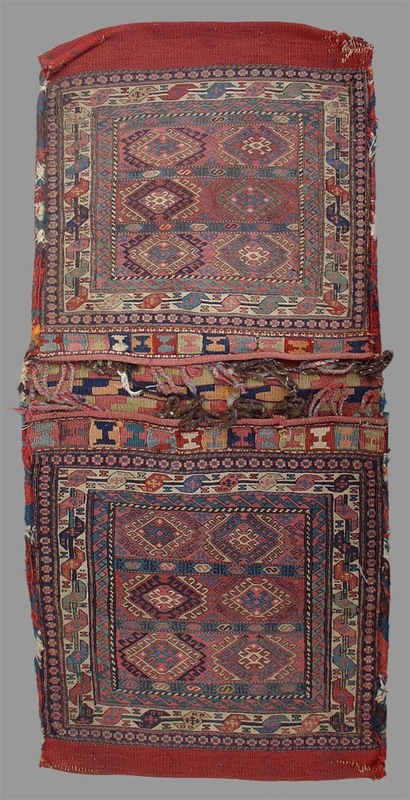 Bags such as these were often disassembled and dispersed, their pile faces used for mats by the rug trade. Not only has this pair remained together for over a century but they are remarkably well preserved with their flatwoven components. Though clearly from the same set of khorjin, small discernable irregularities in drawing individualize each and give a sense of the weaver's range. 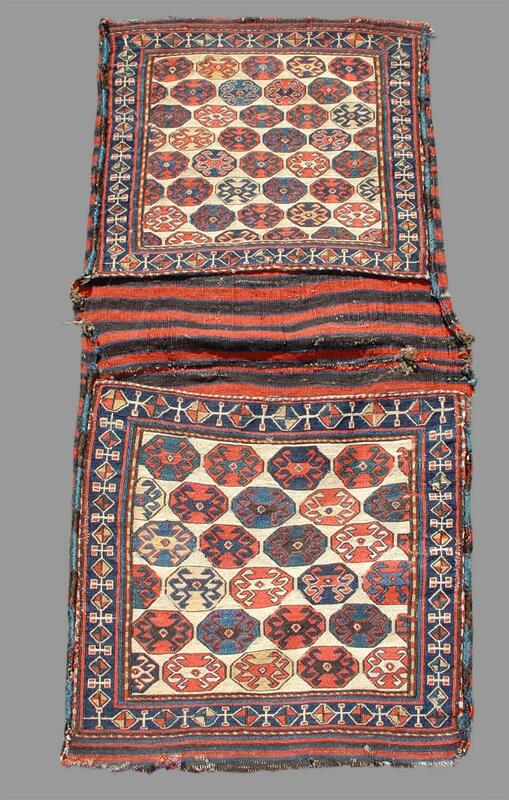 This tent bag from western Central Asia has several strong features; saturated color, an exceptional use of white, a velvety handle, good spacing and fine drawing. The elem with trees is particularly well drawn as are the elongated chemcheh minor guls. It is dated very conservatively. This is a deceptively simple piece. The overall design consisting of the same small geometric ashik-like motifs throughout the field and the main border is enhanced with an incredible sophistication in the use of color. Aubergine and blue predominate but a color count reveals over ten distinctive colors including three blues, two aubergines and two greens. Yellow and white are used sparingly but to great effect. Kurdish sumacs are far from common and as evidenced by this piece, this fact is lamentable. Despite the Turkmen ethnic origin of this group, Afshar bags are often some of the most Persianate of all tribal weavings from within the borders of what is now Iran. The botehs in the field of this bagface are composed of garlands of flowers and the centers of the paisleys thus may be seen as continuations of the abrashed blue color of the field. This piece is in very good condition and has small mended areas. This bagface, as well as the one directly preceding it, once again demonstrates the debt of Afshar weavers to Persianate textile models, particularly shawls. 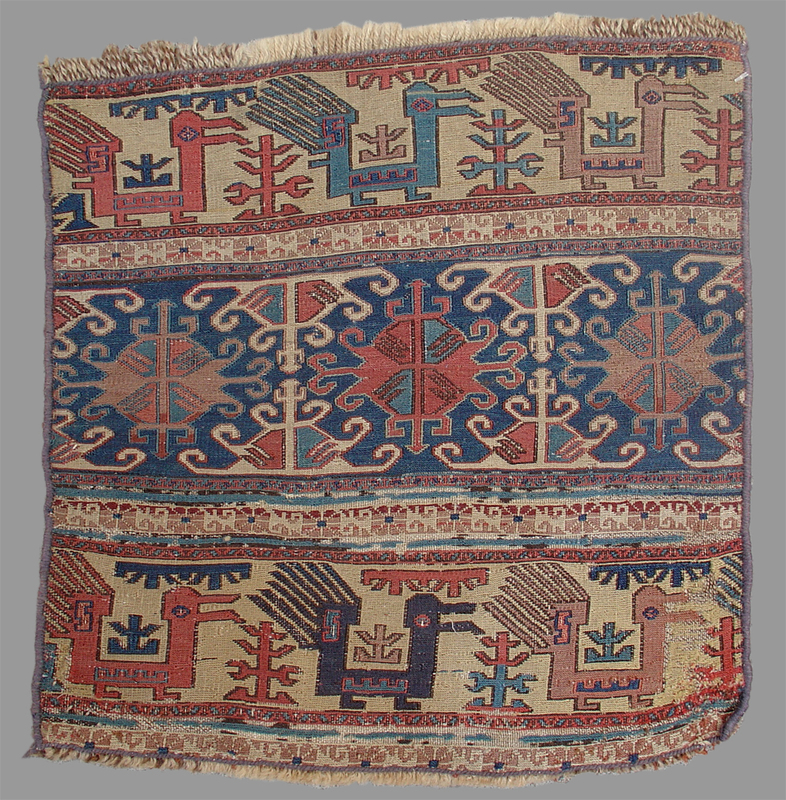 The flatwoven fasteners of this piece, however, depict the sainak, a familiar geometric motif known from Central Asian ensis and even some much older pile weavings from Anatolia. The negative space formed by the botehs of the field is particularly good and portions seem almost bird-like. This is a very colorful example of a complete Afshar bag. 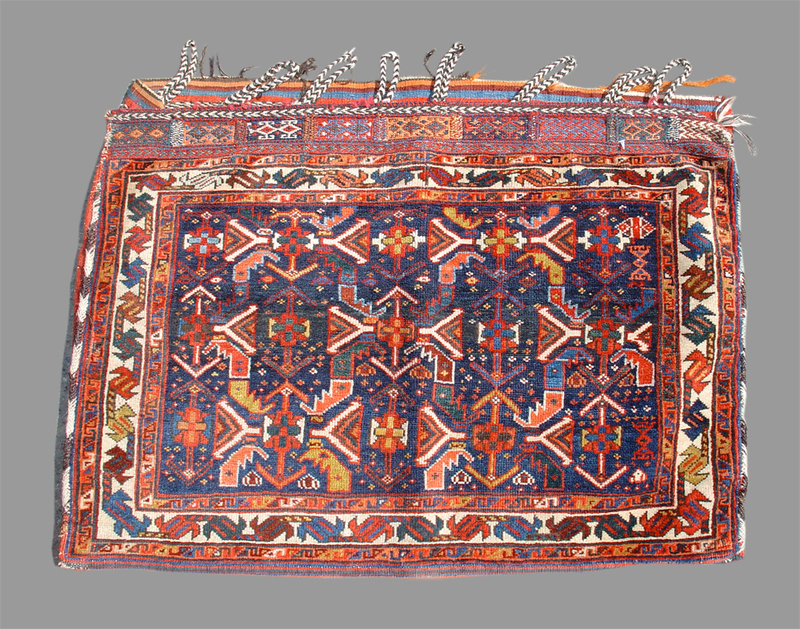 The intricate flatwoven closing system is still intact at the top as are the multi colored bindings attaching the bagface to its striped kilim back. The field seems to be a particularly well spaced geometricized rendering of the classic Persian 'Herati pattern'. This is a classic Shahsavan soumac bagface utilizing some of the most popular motifs found in this group drawn with bold color. These include the elongated conjoined 's'-shaped figures on the top and bottom sides and bifurcated latch-hook elements of the center. The middle of the piece is strongly punctuated with a solitary geometric element. The condition is rough. 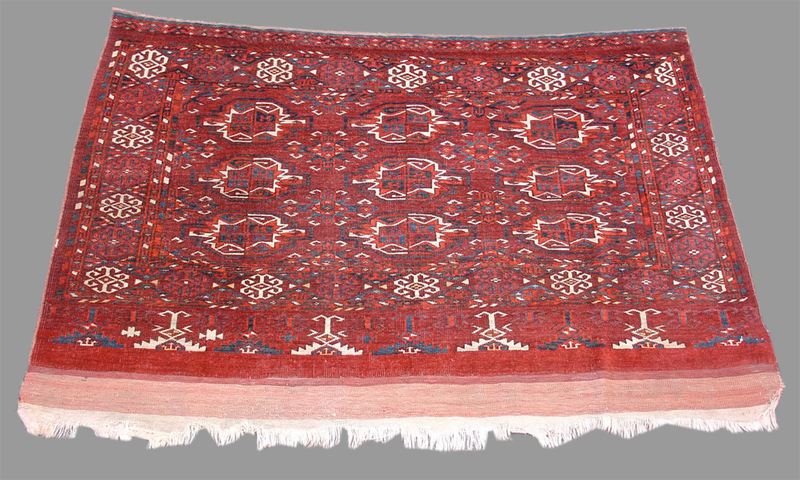 Antique tribal weavings from Persia's southern Fars province are known for their soft wool and saturated colors. This piece with its strong red and primary colors does not disappoint. The botehs of the field are well drawn and create dynamic negative spaces. The single yellow boteh is particularly intriguing.